AF New York asked us to develop a new concept for a showroom that would feature a curated group of the most talented plumbing fixture design companies in the world. We wanted to celebrate these fixture collections and acknowledge the beauty within the design of each product. Each piece should be acknowledge as a work of art. 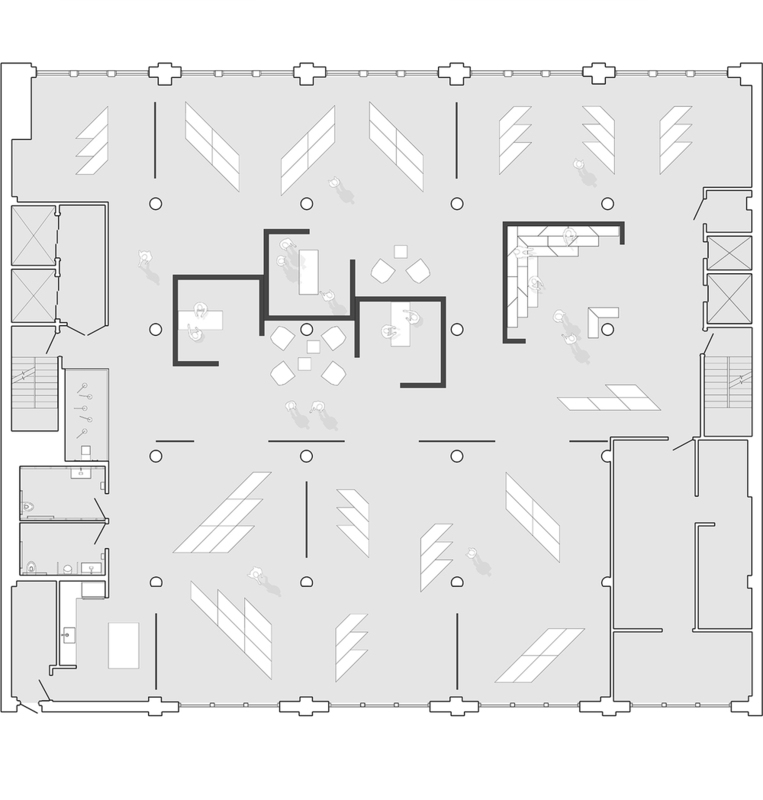 The new showroom caters to the architecture and design community. It was conceived as an art gallery which would display pieces to emphasize their iconic profiles, material quality, and attention to detail. We integrated collaborative "Meeting Houses" through the middle of the showroom so architects & designers can present collections of products to their clients in an industrially raw, yet refined, setting. The Meeting Houses are loosely organized as a series of offset structures; the spaces between them offer more intimate seating and framed display areas for featured products. A large Meeting House near the elevators can be converted into a presentation space for small panel discussions or product launch events. 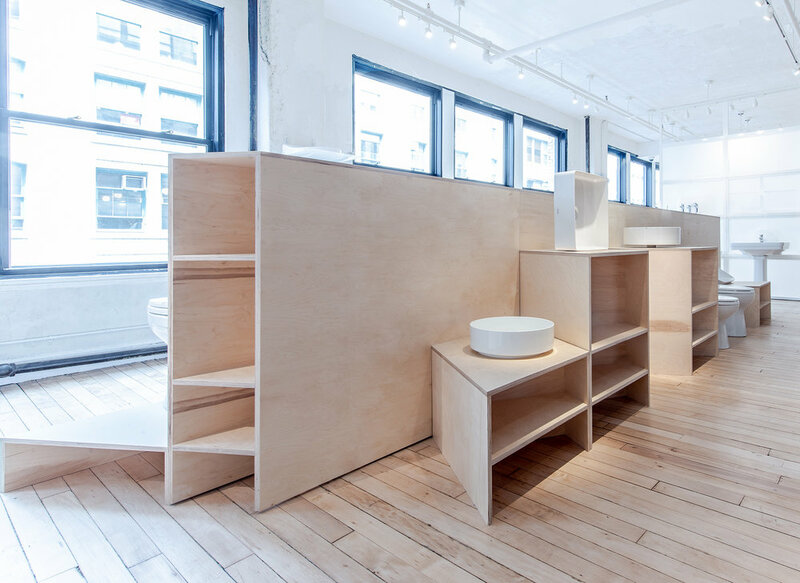 Moveable plywood and frosted resin plinths allow the showroom displays to be reconfigured in artful and inventive ways. The plinths are sculptural and minimal. Like the work of Donald Judd, they hold their own as features in the space. The plumbing fixtures are enhanced by the contrast between rugged and refined. A series of translucent "Map Walls" allow manufacturers to present products as a mapped collection. The matrix of resin panels can be removed and reconfigured to create a compelling presentation for client meetings. A pantry kitchen and two working, themed bathrooms were designed as smaller fixture galleries. 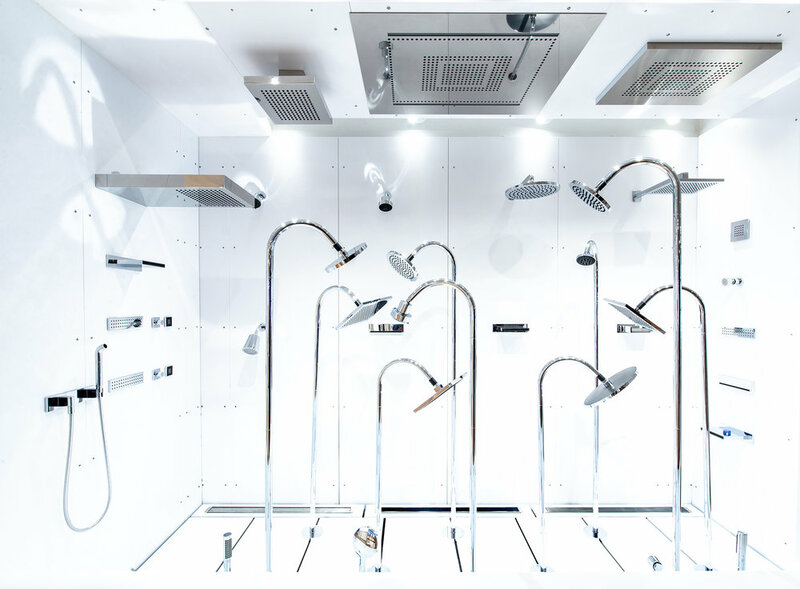 The back wall of the showroom is framed by an open vitrine of working shower heads on "stems" of chrome piping that are meant to reference a planted garden. RH Consultants and Associates, Inc.